It has been so long since I have sat down at this computer to upload an image here or to type anything that I have second guessed which clicks I need to make. Could someone put a few drops of oil in the right places so I can get up and running again? I have recently been working on my high dynamic range photography technique. There's nothing like a formal course to do this- I'm using my education funds to take an online class through Columbus State. Conkle's Hollow State Nature Preserve proved the perfect spot for taking HDR photos. 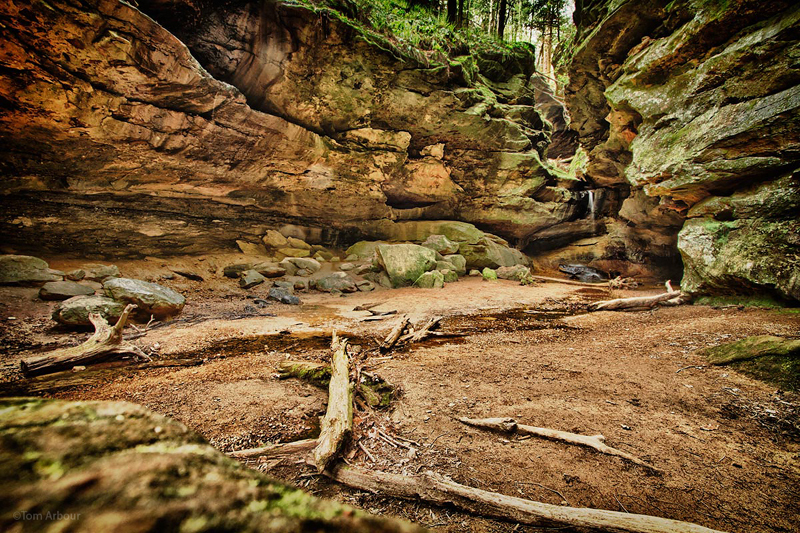 The deep shadows of the gorge underneath the ledges can be brought to the light using HDR. This image has made the rounds on facebook, but I wanted to post it here as well. This space was getting rather dusty. Ahh.....thank you, whomever found the oil can. I'm starting to move again. Thank you Ruth, I really appreciate it. Very rich and lovely. Keep moving! Not to be critical in any way because you're a wonderful and gifted photographer but...I'm wondering how you feel about the out-of-focus rock in the left foreground corner. I think I like it Scott. This element has received a few comments at FLICKR as well. I think it provides a nice sense of depth to the image. That being said- If I had brought my tripod this day, there's no way I would have included that foreground element into the picture. Since the best HDR images are taken using three different exposures taken when the camera is is a fixed location, I needed something to put the camera on. This giant sandstone block was there, and so I tried to position the camera so that I could get the shot I wanted and also use the rock as a foreground element to lead the eye into the frame. I have another image I like better, but it had some serious technical flaws, because I was handholding the camera. I just couldn't keep it still enough to avoid problems when the three images were merged in my HDR software. Everything is a trade-off, right? Thanks for pointing that out- there's definitely a story behind that little hunk of rock.